Car 100 began its long life in 1911 when the all-steel coach was built by the Pullman for the Atlantic Coast Line Railroad. Originally, the car was known as the ACL #985. Around 20 years after its construction, the car was rebuilt by the ACL’s main passenger shop in Rocky Mount, NC into a full-operating dining car and named the Orlando. Until 1951, the Orlando operated on the ACL’s main line between Washington, DC and Miami. It was early in 1951 that officials with the Erwin, TN-headquartered Clinchfield Railroad decided that the railroad’s original office car was getting just too old to keep in service, and began their search for a replacement. In May of that year, the Clinchfield purchased the Orlando, which had become unserviceable, from the ACL and brought it to Erwin to undergo major renovations from the ground up. After almost two years of restoration work, completed under the direction of Clinchfield Chief Mechanical Officer P.O. Likens, the Clinchfield Railroad had its new office car, which was christened Car 100. When the Family Lines System absorbed the Clinchfield Railroad in the 1970s, Car 100 was painted to reflect the Family Lines grey, red and yellow color scheme. Car 100 was later retired and transported to CSX headquarters in Jacksonville, FL in 1983 to be evaluated for use as a fleet car. It was stored in Jacksonville until sold to a private party in Tampa, FL. Car 100 was then again sold to Florida resident Bill Beddell around 1985. Ten years after this, Car 100 was moved to the Aberdeen, Carolina & Western Railway in North Carolina, only to subsequently be moved yet again to the Lancaster & Chester Railroad in Lancaster, SC. In June 2013, the Watauga Valley Railroad Historical Society & Museum purchased Car 100 from the L&C, renamed it the Clinchfield, and assigned it AAR reporting mark WATX 100 in honor of its Clinchfield Railroad legacy. The car received major restoration work at the North Carolina Transportation Museum in Spencer, NC and is now undergoing final improvements required for AMTRAK certification that will allow its use in mainline excursion service. This box car was built April, 1954 for the Clinchfield Railroad. It was in road service on the Clinchfield until 1978 till it became a grocery salvage car for a food distributor in Johnson City, TN for cross town switching. #5586 was retired in 1986 and was headed to the scrap line by CSXT. In 1988 the Watauga Valley Chapter NRHS contacted the railroad about the possibility of purchasing the box car. The railroad agreed and the car was sandblasted and repainted by Corbin Rail Service in Erwin, TN to its original Clinchfield levy before its trip back to Jonesborough in 1988. The #5586 services as our work shop at the Spring St. Coach Yard today. 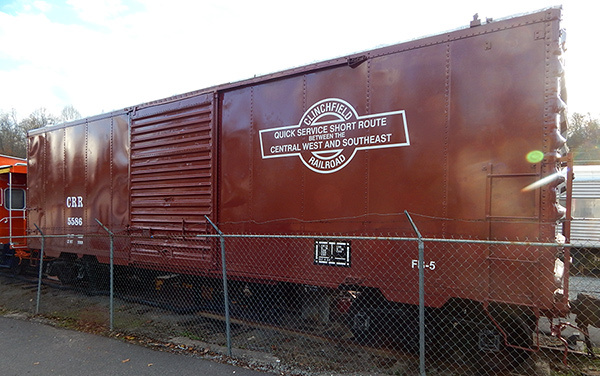 This caboose was built in 1968 for the Chesapeake & Ohio Railroad and used system wide on all kinds of different trains. In 1978, the #903103 was selected to be part of nine cabooses selected to be repainted as an orange "HANDLE WITH CARE" caboose to remind employees to handle their freight in a careful matter. In 1986 the caboose was put in the storage line in Louisville, KY awaiting disposition by CSXT. The railroad sold the #903103 to Watauga Valley Chapter NRHS in 1989; it services as the Spring Street Coach Yard Office. 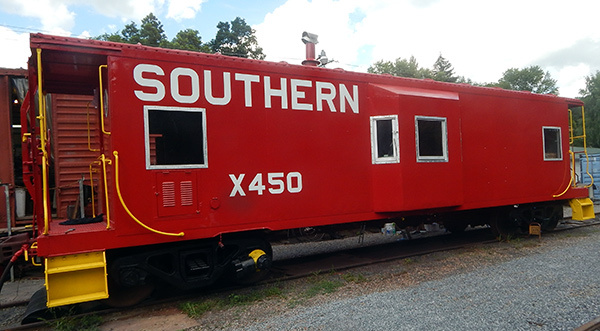 The #X450 was built in 1970 by Garant Corp in Spartanburg, SC, for the Southern Railway which placed it in service all over its system. In 1990 the Norfolk Southern, which inherited the caboose, decided to retire it. It was donated to the Morristown, TN Waste Treatment Center, which planned to use it as a classroom focusing on environmental issues. The classroom was never established and the caboose sat for years, subject to vandalism. The Watauga Valley Chapter NRHS purchased the #X450 from the Morristown Waste Management Center in 2005 and moved it to Jonesborough via flatbed trailer. Restoration of the caboose was completed in Summer 2016 and it now sits proudly on display next to the Chuckey Depot and Museum in Jonesborough, TN.